In June, prepays stayed above 8% for the second month in a row and for the fourth time this year. As to the cause, voluntary prepayments stayed above 6% for the second month in a row, while defaults remained below 2%. Defaults fell back slightly last month and remained below 2% for a record tenth month in a row. This continues the longest such stretch in our database, which goes back to 1999. As for the detail, overall prepayments fell 2% to 8.19% from 8.38% in May. In comparing prepayment speeds for the first five months of 2014 to the same period in 2013, we see that this year is running 11.72% ahead of last year, 7.69% versus 6.88%. As for the largest sector of the market, 20+ years to maturity, prepayment speeds fell by 8% to 7.82% from 8.48%. 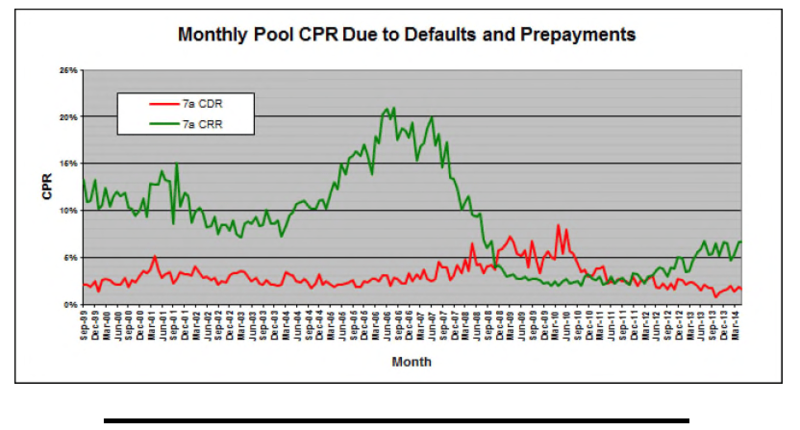 Turning to the CPR breakdown, the default CPR decreased by 11% to 1.59% while the voluntary prepayment CPR was basically flat at 6.60%. This represents the second month in a row of +6% voluntary prepayment speeds. Preliminary data for next month suggests that prepayments will fall back below 7%, giving some relief from +8% CPRs. Increases were seen, by order of magnitude, in the 13-16 year sector (+75% to CPR 5.41%), 16-20 (+73% to CPR 9.54%), 8-10 (+17% to CPR 14.34% and <8 (+14% to CPR 14.99%). Decreases were seen in 20+ (-8% to CPR 7.82%) and 10-13 (-6% to CPR 7.96%). While next month should show a sub-7% prepayment speed, don’t be deceived. We are definitely entrenched in an 8% CPR world.